The European Space Agency has launched its Goce gravity mapping satellite. 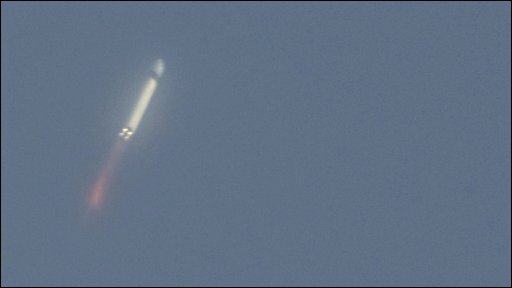 Goce left Earth at 1421 GMT on a modified intercontinental ballistic missile from the Plesetsk Cosmodrome in north-west Russia. The mission will give scientists new insights into how the interior of the planet is structured and provide key information on how the oceans move. 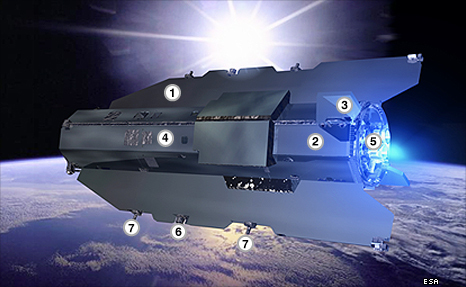 The satellite is part of an armada of European spacecraft being sent up to study the planet. "We have 24 satellites funded and ready to be launched over the next decade; something over a billion [euros] in expenditure per year," said Stephen Briggs, the head of Earth observation science at Esa. "This allows us to take a major role worldwide in providing a global system for the observation of the Earth and for a better understanding of the processes which survive thereon," he told BBC News. A signal confirming Goce had separated from its Rockot launcher and was safely in orbit was received by Esa's space operations centre in Darmstadt, Germany, a little over 90 minutes after lift-off. "In the next weeks we will concentrate on what's called the early orbit phase," explained Volker Liebig, Esa's director of Earth Observation Programmes. "All the systems have to be switched on; the satellite has to fly in a stable way; the batteries have to be charged by the solar panels," he told the BBC. "This will last six weeks and then we will have calibration." It will be late August or early September before Goce can begin its first science campaign. Goce is part of Esa's Earth Explorer programme - seven spacecraft that will do innovative science in obtaining data on issues of pressing environmental concern. 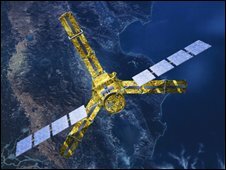 Also being ordered is the Sentinel series of spacecraft which will be part of the Global Monitoring for Environment and Security (GMES) project, a joint undertaking with the EU. GMES will pull together all the information obtained by environmental satellites, air and ground stations to provide a comprehensive picture of the planet. Its quest is to generate continuous, cross-calibrated, long-term data-sets that can be used to inform European policies to deal with global change. The Sentinels are needed to fill in data gaps. In addition, Europe is in the process of upgrading its weather platforms, building a third generation of its Meteosat series, and introducing a new class of polar orbiting satellites known as Metop. This huge fleet of Earth-pointing spacecraft will return an avalanche of data on the health of the planet. "We now need to keep a careful watch on Earth; we are getting into a phase when changes are going to happen really quite rapidly, we think - in terms of climate change and other impacts," said Alan O'Neill, the director of the UK's new National Centre for Earth Observation (NCEO). "What better way to do this than with constellations of spacecraft." Goce will sense tiny variations in the tug of Earth's gravity from its planned operational altitude of 263km. Scientists will use its data to make high-resolution maps of the geoid which, simply put, is a specialised map that traces "the level surface" on an idealised Earth. Geoid information has many applications but perhaps the biggest knowledge gains from Goce will come in the study of ocean behaviour. By combining gravity data with measurements of sea-surface height gathered by other spacecraft, scientists will be able to track the direction and speed of ocean currents. Understanding better how the seas move heat around the planet will help improve the computer models that are used to forecast global climate change. To acquire its data, Goce carries a set of six state-of-the-art high-sensitivity accelerometers. 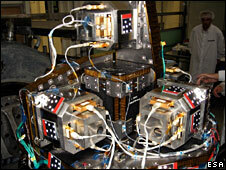 These are arranged in pairs and sit across the three axes of the spacecraft. Their expected performance demanded they be placed inside the satellite with remarkable precision. "We need to know the position of the [accelerometer] 'test masses' to within a picometre or so in order to make sure that we can pinpoint each measurement to a certain location," explained Rune Floberghagen, Esa's Goce mission manager. "A picometre is about 1% of the diameter of an atom, so this is quite phenomenal precision." The scale of some of the technical challenges in building Goce meant it was two years late in preparation. Concerns about the status of its launcher then resulted in a further year's delay. The Rockot was supposed to have flown on Monday but was held on the ground when the service tower which protects it from the weather failed to move back prior to the planned lift-off. Although Goce has been launched from Russia's Plesetsk Cosmodrome, officials from Esa are following the ascent to orbit at the agency's Earth observation HQ here in Frascati, Italy.